In developed countries, new settlements damage the world. Building them brings materials from the world marketplace, causing destruction of nature and atmospheric pollution. The greenhouse gasses emitted by sourcing these materials cause the emission of large amount of greenhouse gasses. The lifestyles of the residents in new developments are also damaging. Even if these newcomers wanted to live a world-friendly life-style, they would find it impossible because the other residents are mostly the affluent who live high-carbon lifestyles with a high level of car ownership. Consequently these developments do not have the facilities and organisation necessary for low-carbon lifestyles such as local shops and public transport. In Britain, new settlements are a step in a process that cheats those that do not own property – particularly the young. New housing is usually sold at many times the cost of the actual bricks and mortar, while the price of property keeps rising (with the occasional hiccup) mostly to the benefit of the old and affluent. 3) One third is the value of planning permission, which belongs to the land owner. The land owner is the biggest winner, having smaller costs than the developer who must plan and organise the construction and sale. In many cases the land owner may also be the developer. Yes. NIMBYS are affluent. They use their influence to stop developments “in their back yards” and these are usually sites near towns that give easier access to jobs, shops and schools and will have better public transport. Nimby campaigns stop developments that might “spoil” their area and decrease the value of their houses locally. Nationally the value of their houses rises by restricting the national supply of houses. Thus Nimbys raise property prices to benefit the affluent at the expense of the poor. In general Nimbys are also the affluent. Greenhouse gas emissions are the most serious threat to the existence of life on Earth. The end-of-nearly-all-life-on-Earth scenario that is presented by LastHours.Org is beginning to look plausible. Most governments have made commitments to reduce emissions. At best they stick to the letter of these commitments, avoiding the reality of the rising emissions caused by their nation’s activities. 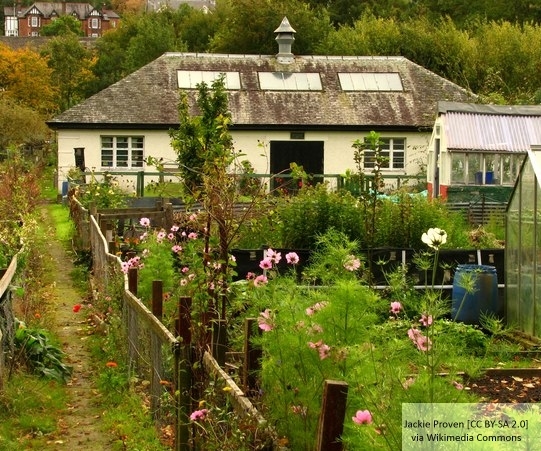 The previous UK Government’s proposal for eco-towns is one example. Given the location of proposed ecotowns, the suspicion must be that the new residents will come from demographic groups that naturally have high footprints. The P2 People and Places demographic system identifies that most of the ecotowns on the short list (but not Rossington) as typical places for demographic groups B4 (Rural Comfort) and C3 (Thriving Families). These groups are more likely to be frequent fliers and heavy users of transport fuel. Standard ET9 of the eco-towns Planning Policy Statement (PPS) concerns the zero-carbon standard in eco-towns, the standard includes all buildings within the town, both residential and commercial, but does not include embodied carbon or carbon emissions related to transport. – No estimates of the emissions of likely residents. – No transport emissions measured. – No emissions from embodied carbon measured. Then why call them eco-towns? Sustainability. The basis of the sustainability strategy is a highly efficient building fabric with good u-values, low air-permeability and carefully controlled thermal bridging. Houses will obtain their heating and hot water from the biomass-fired district heating network. The development is set to achieve CSH level 4 with three homes completed to CSH level 5. Materials should be carefully selected to ensure total embodied energy is at least 25% better than conventional buildings in the first phase of development. This figure should rise in future phases. Preference will be given to materials produced sustainably which do not cause pollution during their life cycle, such as well-managed timber. Did a Derwenthorpe house achieve the 25% reduction in the absolutely dreadful 100 tonnes CO2e embodied carbon in the typical bricks and mortar house to reach the still dreadful 75 tonnes CO2e? JRHT didn’t measure the embodied carbon. The community will also have an electric bus, be joined up to a network of cycle paths and every household will get £150 to buy a bike or bus pass. A polite comment would be that this was aspirational. 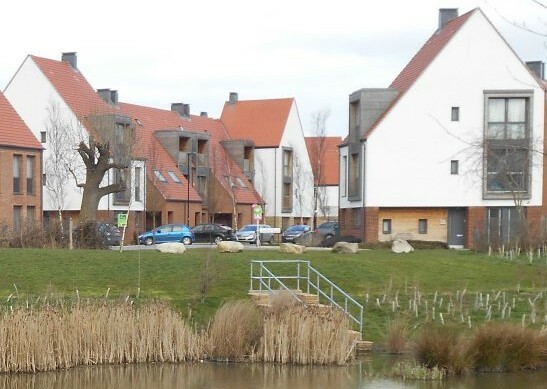 As predicted by Ecotowns aren’t eco and measured by a research project by the Stockholm Environment Institute, the residents of Derwenthorpe have, on average carbon footprints larger than the typical York resident. I recently attended a meeting which presented the research and, from the slides I saw, the residents energy footprint was lower (by about 50%?) but their travel footprints swamped this making their carbon footprint larger than the York average. This is not surprising: the residents of Derwenthorpe, where houses cost up to £300,000, are wealthier than the York average and, according to the research, what they save on energy they spend on travel. Their extra travel is the main reason that their carbon footprints have been estimated to be higher than average. Derwenthorpe is important because it may be “best in class” for this kind of development but it probably has 75 tonnes of CO2 embodied in the construction of a single house and its residents have higher than average carbon footprints. It pretends to be green but is not. To have settlements that get close to environmental sustainability they must be designed for pioneers who welcome a sustainable life-style. This cannot be a hair shirt existence or a complete separation from modern society if such settlements are to be successful. These pioneer settlements are best as add-ons to the economies and services of existing towns and cities. The aim of a green pioneer developments is to create a niche sector where the residents can take advantage of the benefits their lifestyles bring. These benefits will be discussed in a later section. As argued in Making planning work differently, a rich gene pool of settlement types is required so that the fittest can be found. What follows are some guidelines for one new settlement type. 1. It will be managed by a social landlord, a cooperative or possibly even the right private landlord. 2. It will have legal covenants and financial incentives to encourage green behaviour. To give flexibility, initial schemes are best created under a landlord/tenant model because the legal covenants and financial incentives will need to be developed and tuned. Initially, the business model is landlord/tenant : The landlord – social, cooperative or otherwise – designs, develops and manages the settlement The residents who choose to live there pay rent. This model gives flexibility to initial schemes so that the legal covenants and financial incentives can be more easily developed and tuned than an owner occupier model allows. Why should anyone want to live in such a settlement and miss out on the house price bonanza that has given so much wealth to house owners? Answer: Many have been excluded from the bonanza. Why should anyone want to live in this settlement rather than rent on the normal private market?Answer: rents are related to the supply of relevant property. If property is drip-fed onto the market at £300,000 a house (as with Derwenthorpe) rents will reflect these prices. The cost of a single dwelling in a green pioneer development could be lower than £20,000 allowing rents to be a fraction of their existing levels. Why should anyone want to live in this settlement, when car use is curtailed? Answer: The reduction in car use allows a cleaner, safer living environment and a lower cost of site works. In addition, services can exist that are uneconomic at high levels of local car ownership: High car ownership means fewer local services, especially those suited to non-motorists. With a very low level of car use, other modes of transport such as bikes, buses and trains become more important. The choice of location for a site is crucial. Ideally it should be near an urban centre for access to schools, shops and jobs. In this context, “Remote food” is not just food imports which arrive on boats and planes. Here remote food means food that has been delivered through a large transport network: Lorries travel to processing and packaging plants, then lorries feed warehouses for distribution to retail outlets so that consumers can go to collect their shopping in their cars. In this context, “remote food” is not just food imports from overseas. Food imports from overseas are “remote food” but much food produced in the UK is as well. Remote food refers to food that has been delivered through a large transport network:Lorries travel to processing and packaging plants to stock warehouses for further distribution to retail outlets. Then consumers drive to collect their shopping. Longer journeys on boats and planes can extend the transport chain to tens of thousands of miles. Remote food has the advantage of being grown in favourable locations throughout the UK and the world. Particular foods can be matched to local climates. Remote food also has the commercial advantages of large scale production and cheaper labour. For the affluent, there is the advantage of food security: With enough money you can buy most of the food you want. Remote food has a greater transport carbon footprint than local food. Here, “local food” is food that bypasses large distribution networks. The produce from a nearby grower that reaches a local market is on the boundary between “remote food” and “local food”. Local food has the advantages of freshness, knowledge of growers, lower transport costs, the employment effects on the local economy and a lower transport carbon footprint. The balance of advantage between remote and local food will depend on the particular food. In the managed landlord/tenant context local food may be something as simple a fruit trees planted on site or growing beds for tenants to take harvest food when required. A more conventional approach would be the integration of a market garden in the design supplying local shops and vegetable boxes. There is a wide range of estimates of the carbon footprints of food. These are dependent on diet. Meat, especially beef, has a high footprint. Estimates vary between 9% and 51% of total world greenhouse gas emissions. The United Nation’s Food and Agricultural Organisation (FAO) puts this at 18%. Food production has a large carbon footprint. This too will be discussed in more detail in later sections. Residents should be informally educated about the carbon footprint of food via local shops and occasional communications from the landlords. The Green Settlement Handbook aims to provide a blueprint for a way of living that avoids the costs of conventional housing, creates an economic environment that can provide services suitable for the residents and allows lifestyles that don’t destroy the Earth. The in this blueprint legal frameworks and financial incentives are as much part of the design as a site master-plan. A discussion of these will be in the next section. Interesting. I think the difficult issue is the food, getting away from remote sources and even if vegan or vegetarian i would think, for areas with affordable land. Going out of the UK (i no longer live there) we have a house with land right on the edge of a town in Normandy, France. It is a poor town (and not too pretty) as it was destroyed during the landings and reconstructed. But it has schools, shops, some public transport. By far most people drive, and as i said the residents are definitely not rich. Starting a local small agricultural economy there would seem to me a long term enterprise. I fear we city people lack skills and knowledge of that kind i think and it’d be a tough learning experience. Possible but quite hard work!! For a while supermarkets would still have to make do. The emphasis is on “choose to live there”. I will be returning to this in due course and discussing ideas form economics like the “consumer surplus”. In a situation where most people are motorists a Green Settlement won’t work. Restricting the use of cars enables a very different lifestyle. An example: The canals restrict cars in Venice and people that live there and would probably prefer it to Los Angeles. Why a green field site? Surely by modifying an underused inner city site you keep residents close to their work and thus reduce their transport costs – the main problem identified in the York example. It may be less polluting to move food rather than people and it may be less polluting to keep food production and consumption separate, but close and integrated. My vision would be that people just use cars less and as they do so, appreciate the advantages – a diluting effect within the current environment as opposed to what I see as your idea of isolated pockets of no go zones for cars. The latter seems to set car lovers against car haters. The former just reduces car usage because there are better options. Also I think you need to carefully consider the population density acheivable by new development versus re-development. But my main point is, why build new and use more land when you can repurpose inner city living space? I envisage greenfield sites fairly near towns, if possible, on railway lines with many more local jobs – including on food production. Walking to your local market garden shop should be the norm. We are not short of land. Anyway labour intensive horticulture can provide more food than farmers in their mechanised, chemical fields and use less land than the farmers. Until there is separation from motorists non-motorists can’t have proper local facilities. Fitting tall buildings into a city causes enormous embodied carbon. According to the Barker report, people value city parks enormously – much more than green belts. Brownfield sites should become parks.